Laptop screen repair via LCD replacement is surprisingly simple, because fixing laptop screens is easy, and stress-free. Our step-by-step laptop screen replacement video will ensure that you cannot go wrong when following these simple instructions on how to replace a laptop screen. In fact, this job is so easy that the vast majority of Laptop-LCD-Screen.co.uk clients have repaired their damaged screens within only 30 minutes through using our simple and easy step-by-step video. Still worried? Rest assured that after reading these instructions and watching the short laptop screen repair video, you will not believe how easy fixing a broken laptop screen actually is. You do not need any technical knowledge or specialist tools. Just take six minutes to watch this ultra-helpful video, and not only will you will save yourself time and money, but you will have your new screen fitted within half an hour from now. Finding a new LCD screen: Here at Laptop-LCD-Screen.co.uk, we stock every conceivable make and model and can ship for a next day delivery. We also sell at trade prices to the general public. 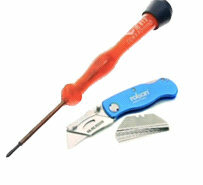 Preparation: All you need to begin is a small Philips-style screwdriver and a very sharp Stanley or scalpel-style knife. Be extremely careful when handling any kind of sharp knife. Before engaging in any repair, you must remove the battery and unplug the laptop from its power source. Removing screws and caps: In order to remove the LCD screen frame from the front of the laptop, you need to first locate the screws which hold the screen to the frame. These screws are normally located in each of the four corners, and they are covered by plastic or rubber caps. These caps can be removed without damage through using your sharp knife or scalpel as shown in the video on this page. Once the caps are removed, simply unscrew the screws that are underneath and put them in a safe place for later re-insertion, being careful to note which screws go where. Now remove the screen frame. Be gentle but firm. The screen will usually unsnap or pop off from the plastic. In some places, it might be glued with a light glue or strip tape, but it still shouldn't be a problem to separate the screen from the body. Removing brackets: Every screen varies in the way it is fitted, but the general principle is the same. In our video we've chosen a Sony VAIO laptop as we feel this represents a good generic style machine for explaining the concepts of LCD screen replacement to you and forms a good basis for instruction. Once the bezel (plastic frame) is removed, the display, inverter and quite possibly some remaining screws will all be visible. A little care is needed when removing the bezel, but we explain how this can be done without risk in the video on this page. If there are screws securing the display to the rear of the machine, remove them, as well as any brackets holding the display in place. Once the display is free of framing brackets and screws, you can usually lay it flat onto the laptop keyboard and you'll be left with the frame and the screen. Removing the video or VGA / LVDS cable: You can now remove the video or VGA cable from the back of the screen. Again, this is very simple as can be evidenced in the laptop screen repair video. Don't worry, the parts are not as delicate as you might imagine. There's usually a piece of tape across the cable which holds it onto the back of the screen. Pull the tape downwards gently to release and remove the cable. Sometimes there are clips holding the cable in place. If so, simply unclip and remove the cable. Next, remove the old broken LCD screen from the LCD frame. This is held into the frame via screws along the side of the machine. Once these screws are removed, the LCD panel should fall out of the frame and be free, other than the remaining attached cable, which is the inverter cable. 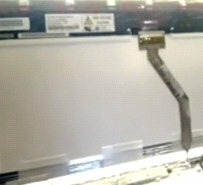 Removing the inverter cable (older screens only): The majority of screens have an inverter cable that is located underneath the screen. It is usually a long strip or circuit board. There's often a pink and white – or sometimes black and white – cable that comes out of the screen and has a white plug that pushes into one of the sides of the inverter. This is easily removed by pulling it out gently. When re-inserting this cable, rest assured that it can only be fitted the correct way around. How's that for simplicity? Please note that older laptops can sometimes come with an additional power cable at the bottom of the screen. However, this cable is easily unplugged and, as with the inverter cable, it can only be reconnected to the new screen the right way around. Watch the video at the top of this page for instructions and see just how easy this step-by-step process is. Fitting your new screen: Congratulations! If you have got this far, the rest will prove a doddle. Fitting of your replacement laptop screen is simply a reversal of what you've just done. Don't force anything, be gentle, and ease your new screen into position before re-assembling your laptop by following these instructions in reverse. It's simple: The job is simple and there is great satisfaction in knowing that you have succeeded in saving yourself, a friend or family member the time and expense involved in having a laptop screen replaced professionally. Just look at all the glowing testimonials we have received from countless thankful customers who have successfully replaced their own laptop screens through using our instructions and watching the laptop screen replacement video above. Save money: You will save a great deal of money. Get a quote from professionals and see for yourself how much they charge for a job which will likely take you no more than 30 minutes after watching our short laptop screen replacement video and reading through the instructions above. Save time: Even more valuable than money is time. We supply your new laptop screen the day after your order is placed, thus ensuring that you are back up and running without delay. What's more, the average time taken for a non-technical person to change their screen is just 20 minutes, with the current record standing at just 10 minutes! Safeguard your data: Your laptop likely contains data that is personal, private and invaluable. Can you trust your local laptop repair centre, not only with the safe handling of your machine, but with your precious data and private, personal information? Impress friends: Oh, let's not forget that you'll look pretty cool when replacing the laptop screen of a non tech-savvy friend or family member! Who would guess that you learnt that skill from a simple six-minute long laptop screen replacement video? Your feedback: Check out hundreds of testimonials which pour in every month from people just like you. People without any technical knowledge whatsoever are testifying to how EASY laptop screen replacement really is. Laptop-LCD-Screen.co.uk has helped hundreds of thousands of people to save time, money and stress through replacing their own screens. Our integrity: We aren't in the business of encouraging you to spend money with us if a replacement screen is not necessary. Take a browse around our comprehensive website and you will find our unique laptop screen diagnostic and troubleshooting tool which will help you determine if you really need a replacement screen. We listen to you: Check out our FREE online Laptop Screen Blog which has answers to many frequently asked questions and is updated regularly. We go the extra mile: We aim not just to meet but to exceed your expectations. That is why we offer FREE fast support from our technical experts. We understand that your laptop screen is valuable. Your custom and satisfaction is just as valuable to us. That's why we don't just sell you the screen but have technical engineers on standby if you need them. In the unlikely event that the instructions above and the laptop screen replacement video aren't sufficient, we are just a friendly phone call away. Where can I buy a replacement laptop screen? What does laptop screen connector position mean? Can I Upgrade my laptop screen? How can I clean and care for my new screen? What are "Compatible" laptop screens? What is Laptop Screen Resolution? LCD - What Does It Mean? What's the difference between a MATTE and GLOSS screen? What do the terms CCFL (LCD) and LED mean? What is a laptop screen Inverter? Do I really need a replacement laptop screen? e-How also has a wealth of information that may help you.